The America I knew is collapsing - folding in on itself and apparently reinventing the very basis of its existence. The man in the White House is rocking the world. Regardless of what anyone says, Donald Trump’s stunning victory will forever reshape the political landscape in the USA. I resolve to examine the underlying social fabric that led to this situation. A cycling tour is my preferred tool. 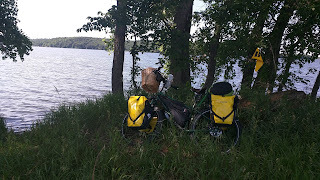 I say goodby to Hank and Carol and continue east to Redwing, winding through farmland, then along the shores of Lake Byllesby. Homes with private waterfront line the lake. Their ubiquitous expansive and well kept lawns, boats, and 2-3 car garages are a testament to a way of life that people back home in Israel and Palestine can only dream about. Then I come to a neighborhood of what middle class Americans might call ‘starter homes’ - frame houses with 2-3 small bedrooms and two bathrooms - maybe 1,000 square feet (110 meters) with a smaller lawn, but still a 2-car garage. We would call it a ‘villa’. The riding has been easy with few hills to slow me down. I’m now aiming for the Cannon River Valley with it’s long slope down to the Mississippi River. Still on the roads though, but the cars and trucks give me a wide berth, and even the secondary roads tend to have a decent hard shoulder to ride on. People smile or wave when they pass me. Seems to be a friendly bunch of people in this area. I was warned about road hogs and disrespect for cyclists, but have seen none of it. The village of Cannon Falls looms ahead. I check it out and find a grocery store to stock up for a few meals. I also poke around the local hardware store looking for a colorful cowboy neckerchief to use as flag. They only have a blue one so it’ll have to wait. 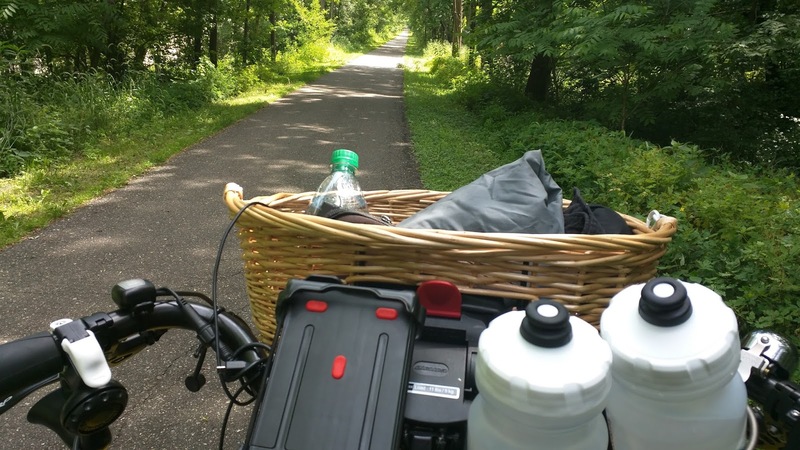 The trail head begins in Cannon Falls and continues for 20 miles (32 km) to Red Wing, a paved walking and cycling path meandering along the river through some lovely wooded areas. No cars. No trucks, just nature. I cruise. There’s a visitors centre along the way. A sign says bikes are supposed to pay a fee, but I can’t see where. I guess the trails costs money to maintain and the authors decided that the users should pay, rather than general taxes. Seems fair, but there’s no-one around to pay. I continue. The trail meanders along the Cannon River, which moves along at a rapid clip. A group of kids on canoes passes me by. The current moves faster than my bike. It’s a glorious day, and hot. It’s a weekday so few others are out cycling or walking. I zip the legs off my trousers and put on sunscreen. Lunch is at an idyllic spot overlooking the river, enhanced by the scantily-clad young ladies floating by on giant truck inner tubes. The wave and giggle. Life is good. But good things do end, and I peel off the trail at the beginning of Red Wing and look for a coffee shop. This seems to be the seedy side of town. Off the Main Street there are weeds growing out of the concrete sidewalks, boarded up buildings, and shabby bars advertising ‘exotic dancers’. Finally I Google ‘coffee shop’ and zero in on Caribou Coffee just off Main Street. Only in America are there streets of that name - and numbered streets. I love it. I settle in for a coffee and a work session. Still have a company to run. The emails are endless . . . . .
By 6pm I’ve had enough, so I head off to Island Campground and Marina, which turns out to be a combination trailer/caravan park, and the site of a huge bar with an outdoor stage for weekend rock bands. It’s not the weekend. I wander around looking for someone to give money to for camping. Apparently not. Finally I ask a grizzled fellow coming out of a trailer what to do. “Weeeel” he says, “I reckon your best spot is at’n point t’over there”, and he gestures to some trees near the river with a little patch of grass between them. “Money?” He replies to my query, “Don’t rightly know” - and with that he goes inside and shuts the door. The flying bugs and mosquitos are everywhere so I put my legs back on, put on a long-sleeved shirt and plaster my hands and face with 99% deet. That keeps them off. I put up the tent and cook a mess of dinner on the new upgraded Biolite woodburning camp stove. Sunita had bought me a couple of freeze dried camping meals. I have never used them before, so I fried up a little garlic, onion and tofu with hot red pepper, freshly ground black pepper and cumin. Then I add water, bring it to a boil and add the weird looking stuff in the bag. Take it off the stove and leave for 15 minutes. It actually tasted pretty good, washed down with some Summit Pale Ale. I crawl into the tent exhausted and sleep - or so I thought.